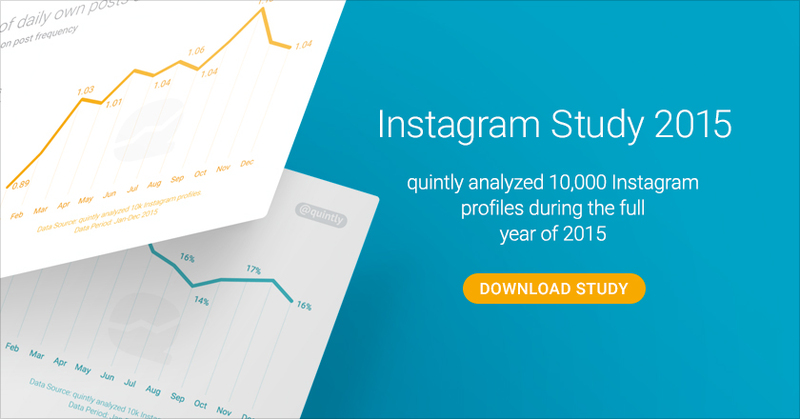 The social media analytics provider quintly published an Instagram study analyzing 10,000 Instagram profiles for the whole year of 2015. The analytics company reveals decreasing growth rates of the average profile as well as a distinct drop in interactions. The study showed interactions dropped by 50% from January 2015 until end of December 2015 for many profiles. Different sized clusters make the findings applicable for every marketer on Instagram. To make the study easy to interpret quintly chose the most important metrics, such as number of own posts, growth rate, interaction rates as well as video and photo post frequency and discussed the outcomes briefly. By showing the development for the whole year of 2015 the reader is able to easily identify trends from the past and make predictions for the future. The data revealed can massively influence the decision-making for a business marketing on Instagram.